The car service Uber has quietly rolled out a new version of Uber Lost, the system that helps riders locate items they’ve left in drivers’ cars. The system allows you to quickly reference rides you’ve taken in order to locate it as fast as possible. After we saw some Uber service reps tweet out a link to the system aimed at riders looking for lost items we did a bit of digging. The service is now live on Uber’s site and there’s a link provided on receipts emailed to a rider after their trip is completed. That seems like a good choice as that’s likely where they’ll be looking for a support number to call about their item. Now, they can just tap the link. The system is nothing complex, it just provides you with a simple list of your recent trips, with beginning and end points to help you figure out where you were when you lost the item. Each ride entry contains the driver’s name and phone number so you can ring them up directly to ask them if they’ve found your item. The new system isn’t anything earth shattering, but it’s a nice addition to the service’s tools for riders. Having recently watched someone attempt to locate a piece of luggage left in a cab, I know just how annoying the process can be. It’s bad enough when you know the cabbie’s medallion number but it can be a real nightmare when it was a quick jaunt in a busy part of town and you have to track down the ride by time and location through the dispatcher. 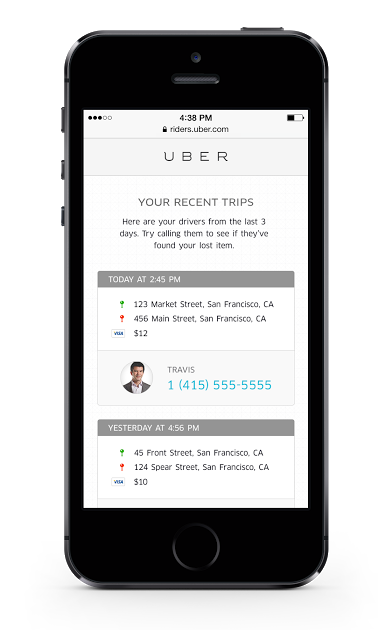 With the Uber system you’re presented with a way to call the driver back directly, rather than wading through the call center of a cab company and trying to cross reference time, location and cab availability. This follows on the heels of Uber shipping a series of small enhancements to its service including fare splitting, map and ETA sharing with friends and PayPal support. Recently, numbers from Uber’s internal dashboard were leaked which pointed to the company being in pretty decent shape, business wise.